Crystals. For years they have been resigned for your kooky Aunt Myrtle, who never quite moved on from the 60's. Or they are collecting dust on your window sill. But now, we are embracing more woo-woo - and these glimmering stones have been thought to heal you, enhance energies and basically bring about good vibes. Who doesn't want all of the goodness you can get surround you and your honey on your wedding day? Rose Quartz - the love stone! After seeing this stunning cake, (and this one too! And here's a whole bunch - I just cant stop looking! ), I was totally inspired to use crystals in wedding beauty and came across all this crystal inspo for you to use on your big, sparkly, magical day! 1.Your engagement ring doesn't have to be the only sparkling stone on your finger - why not incorporate crystals by getting a geode inspired mani! 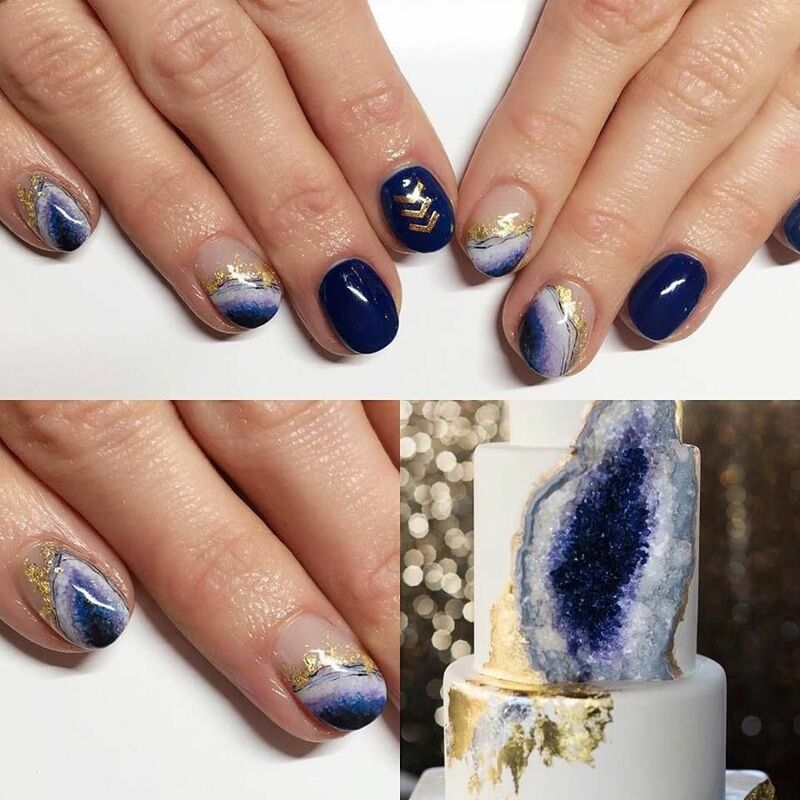 These nails are inspired by another fabulous geode cake - see I told you I couldn't stop looking at these beauties! I really like these nails because its not all over, and the navy color is a great way to bring in "something blue." 2.These earrings are so romantic and organic, and I imagine them with a soft romantic up do. When you get a druzy stone you are getting some serious glitter, so these would also bring a beautiful light to your beautiful face! 3. Clear Quartz is said to bring harmony, clarity and calmness, but this headpiece made me feel all the feels. It is so unique and I love the idea of a half up style OR a big beautiful bun with this headpiece just accenting your hair ever so perfectly! 4.If you are a crafty gal, please make these agate slice hair clips. These super unique and super stunning hair clips could double as a gift for your bridal party. I think I might be ordering some agate pieces to try these out for myself. Want to include crystals into the rest of your wedding? Check out this post - I especially like the idea of giving each guest a closed up geode to crack open, talk about a conversation starter and unique wedding favor! What do you think of the crystal trend? Would you rock any of the crystal beauties on your wedding day? Head over to our Facebook page and tell us what you think!